As high-tech gadgets become increasingly advanced with ever-improving video and audio quality, we find ourselves needing extra speed and memory capacity to store our high-resolution digital masterpieces. 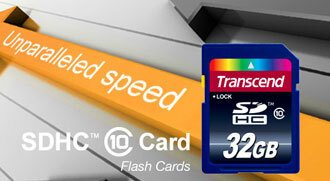 Adhering to the new Class 10 specification, Transcend’s SDHC cards perform at a transfer rate up to 20MB/s on devices supporting SD 3.0, ensuring your device remains quick and responsive while recording and viewing files. The SDHC Class 10 series offer larger-volume data storage and optimized recording performance with support for FAT 32 file formats. With up to 32GB of storage, you can store your entire music or picture collection on today’s high-megapixel digital cameras, HDTV digital video cameras, PDAs and other memory-hungry devices.